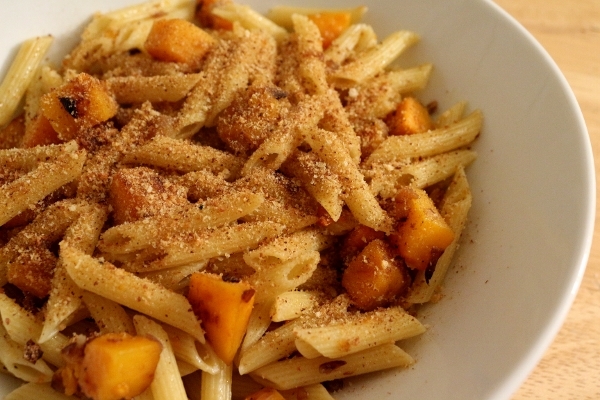 It's time for another installment of 12 Weeks of Winter Squash! This will be my last post until after Thanksgiving. Last week, I shared a recipe for Butternut Squash Tart with Fried Sage utilizing the neck of a butternut squash, and this week I'm sharing what I did with the remainder of that squash, a simple yet tasty pasta dish sweetened with squash and onions, with a little edge from some anchovies and crunch from bread crumbs. It paled in comparison to the tart (I made both dishes the same day), but I honestly enjoyed it and was even quite happy with the leftovers. The anchovy flavor is mild, but if you have a serious aversion then this is not the dish for you. 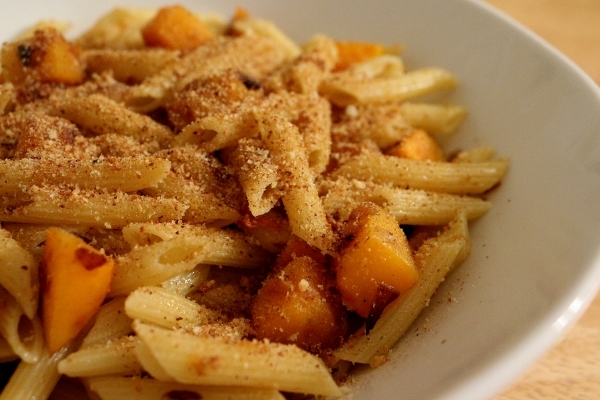 This also yields a serious amount of pasta between the pound of penne and the pound of squash! The original recipe claims to serve 4, but at the very least you can get 6 good portions out of it. 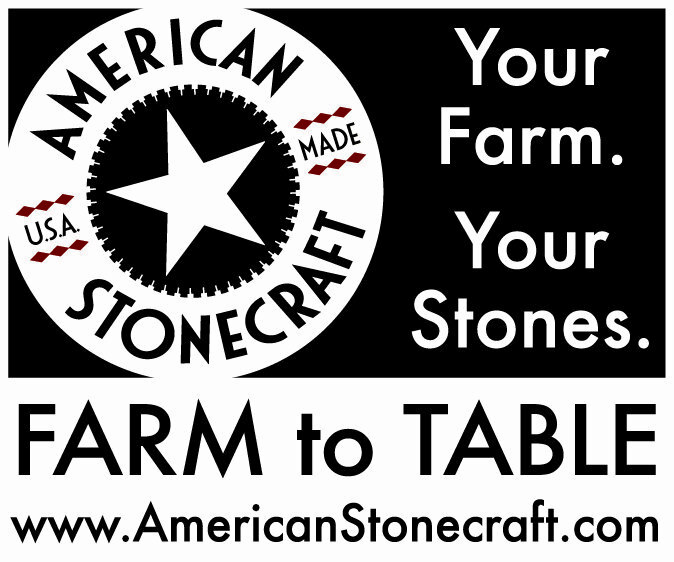 Bring 6 quarts water to a boil and add 2 tablespoons salt. In a 12-to-14-inch saute pan, heat 2 tablespoons olive oil over medium heat. Add the onion, garlic, and anchovies and cook over medium heat, stirring occasionally, until the onion and garlic are softened and the anchovies have begun to break up. Turn the heat up to high and add the squash cubes. Toss over high heat for 5 minutes or longer, or until the cubes are tender and the browned at the edges. Season with salt and pepper and remove from the heat. Cook the penne in the boiling water until al dente. 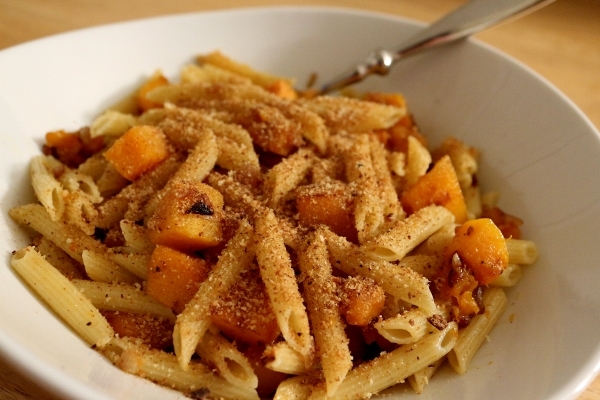 Return the squash mixture to the heat, drain the pasta, and add it to the pan. Add the remaining 2 tablespoons olive oil and toss over high heat for 1 minutes. 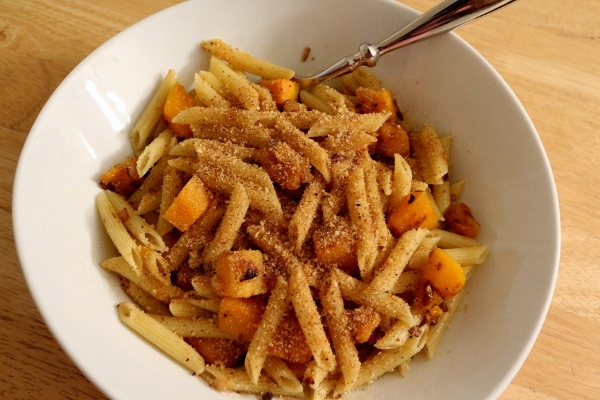 Divide the pasta and squash evenly among individual pasta bowls, top with bread crumbs, and serve immediately.